Located 85km west of Kawthaung, this is the southern most dive site in Burma’s Mergui archipelago. The dramatic underwater terrain has something to suit most divers. There are walls, sloping reefs, boulders and pinnacles. The most popular section of the dive site however is the tunnel that runs all the way through the middle of the island. The tunnel starts on the southern wall. Divers first descend to a large cavern that starts just 5m below the surface and drops to the bottom of the rock at 25m depth. On the western edge of the cavern is a large window archway that divers can swim through and which helps to light the cavern. The cavern is covered in clams, barnacles and sponges as well as hingebeak shrimps, crabs and lobster. Nudibranchs such as fried egg nudibranchs and twin magnificent nudibranchs can be seen. Scorpionfish are numerous. Twin spot lionfish shelter on the wall whereas larger common lionfish are more often free swimming. To the east of the cavern the tunnel entrance starts at 17m. The tunnel is approximately 30m long. There is a large chamber inside but it narrows dramatically as divers reach reach the northern side where it spits in two offering two possible exit routes. The left tunnel is very narrow are can only be wriggled through by removing the scuba unit. Dozens of giant lobster cover the walls. Shrimps are also much bigger than on the outer walls. But the star attraction are the very large tawny nurse sharks that live in the tunnel and occasionally block the route through for divers. The right side passage is larger and exits onto the southern reef at 21m. The tunnel is very dark inside and strictly speaking this is an overhead environment dive that requires special training. However divers can always see light from the tunnel entrance. A torch is required inside the tunnel. Marine life is huge inside. The west side of Western Rocky has an attractive sloping reef with pore corals and soft corals plus seafans and anemones. Schools of glassfish cover large sections of the reef and hunting fish like trevally dart around the edges. 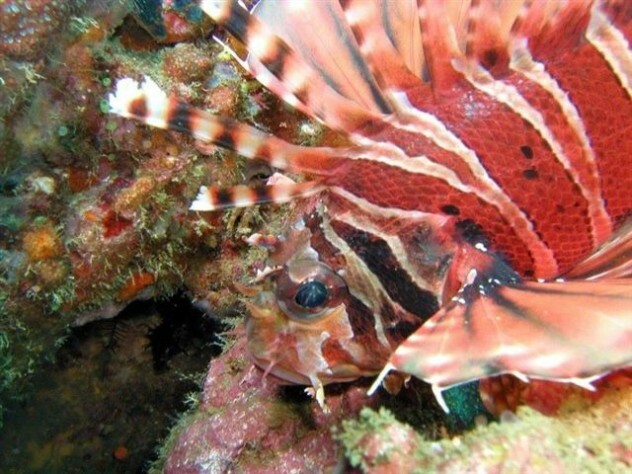 Lionfish and scorpionfish are prolific. Flutefish are large here and giant pufferfish are also common. Several species of moray eel can be seen, the most common are fimbriated and white-eyed morays. Western Rocky south wall descends down to 35m and has an overhanging ledge in the shallows. Away from the wall are some rocky patches that are home to white tip reef sharks. The shallower section of the wall is great for night dives, very colourful with orange cup corals and red finger corals. Lobsters and crabs are everywhere, including the beautifully camouflaged sponge crab and decorator crab. White tip reef sharks may also be spotted on the night dive. To the east of the main island are a scattering of small pinnacles that can be reached underwater from the eastern tip of Western Rocky or can be dived separately. All the same fish life is present here and currents swirling around the pinnacles also attract pelagic fish such as rainbow runners, tuna, chevron barracuda and giant trevally. This area also gets it’s fair share of whale shark visits.